Obligatory update before we go into our main programming of the evening. Last week has been all about this trailer, honestly. This is our big gameplay reveal and I want it to go well, so I've been working almost around the clock trying to ensure this going smoothly. And I managed to do that to such degree we're actually launching the trailer early, so there's that. Now that the trailer is out in the wild, I'm not exactly sitting on my hands waiting for reception. Don't get me wrong, I'm highly anticipating what you guys have to say about it, I just can't stop to wait what that might be. No, we go full steam ahead, finalizing enemy placement in the forest level you see in the trailer while doing preliminary work on the next map, all the while cooking some new enemies. Rest? What is this weird concept you speak of? But enough talk! Gameplay teaser trailer time! What on Pluto is Début Gameplay Teaser Trailer? This is one horrible monster-of-a-title, but that's what this is; Video début of TAGAP 3 gameplay in a form of a teaser trailer. Why didn't we just call it Teaser then? Well, as of late, everything labelled plainly as 'teaser' or 'teaser trailer' have been nothing but target renders and/or image branding CGI animations that have little to no connection to the final product. I'm not saying this is bad, on the contrary some times this is better for trying to get the point of the game across in a minute. Still, we obviously weren't doing that, so we wanted to differentiate our video from this label. As good examples of both; To me this is a teaser trailer – and this is a gameplay teaser trailer. Both are brilliant in their own way, only the latter was appropriate for making TAGAP 3's début. Why only 720p? Isn't TAGAP3 HD enough? You may have noticed that the trailer is 'only' 720p and runs 30 FPS. This is not limitation set by the TAGAP 3 engine, but Petja's hardware. And to be specific, TAGAP 3 has no problems running 200+ FPS in 1080p on Petja's game rig, but apparently his hard drive isn't fast enough to dump out 1080p and/or 60 FPS FRAPS video files, at the rate of 4 gigabytes a minute. I'm seriously considering getting some proper video capture hardware, so who knows, perhaps we'll one day get to see a 1080p TAGAP 3 trailer, but right now we're stuck with 720p and 30 FPS. 0:00 – Our new embedded Penguin DT logo. Well, not so new as it's the same logo as before, only with nicely rendered embedding and radioactive glow. As before, in the game this emblem doubles as the loading bar. 0:02 – To hammer in the HD-ness of TAGAP 3, we cut right into our new InfoCOMPs. I first intended to add this as the usual pre-trailer title card, but then I realized we could go all 'meta' have our in-game notification appear fluidly in-game with zero effort. To geek this up, it's HD sprites, in-game InfoCOMPs, dynamic in-game camera and shaders galore, all in the very first cut. 0:05 – Meet our music for the evening! This was actually a demo for an in-game song, which Petja then took and re-arranged for the teaser trailer. This trailer version obviously has a steeper progression curve, rising from very mellow to rock-tastic, accompanied by TAGAP Theme melodies. Still, this is not 'the' theme for TAGAP 3, we're saving that one for the first full trailer. You can get the song free via SoundCloud. 0:07 – This calm scenery montage may feel like an odd way to début Penguin Apocalypse III, but it serves a very specific purpose; To introduce some of the Pluto scenery, as well as the design language we decided to roll with. Ceramic surfaces and cold steel meet with cybernetic flora and round shapes. LOTS of round shapes, actually, as even all the monitors are round here! 0:12 – While gameplay triumphs all, we still wanted to make the environments feel functional for the space penguins to live in. Whether it's a basketball court in the prison yard or a maternity ward waiting room, there are little details a plenty to make them feel, if not real, then at least surrealistically plausible. 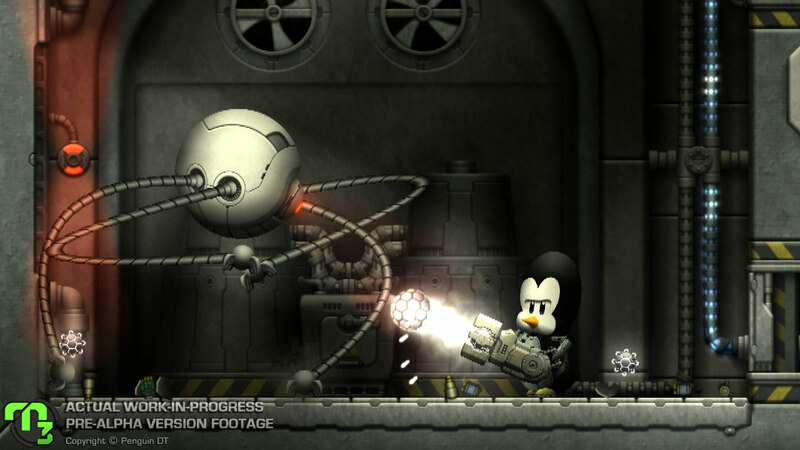 0:24 – Gameplay begins proper! This is a short in-game cinematic sequence taking place in the Pluto hospital ward. First and last of the cinematics in this video, this seemed like a good way to introduce Pablo as well as showcase facial expressions and more of the dynamic camera. Pablo's voiceover is from TAGAP 2, mind you, and will be re-recorded. 0:29 – TAGAP 3 being pseudo-Metroidvania in structure, many weapons have world traversing function as well. Here, for instance, freezing the water surface allows Pablo to jump off it, granting him the access to the other side of the water tank. This Cryogun doesn't freeze just water and enemies, but floors as well; Slippery, icy floor is a great crowd control option. 0:33 – Attack of the Cyberpenguins! Only few of the big enemies in TAGAP 3 are just huge bullet sponges, instead having specific strengths and weaknesses. You can still just shoot in their general direction and get things done, but using well placed shots of the right kind will get you there faster. In case of the Cyberpenguins, the plexi-glass dome covering their brains is a weak point. 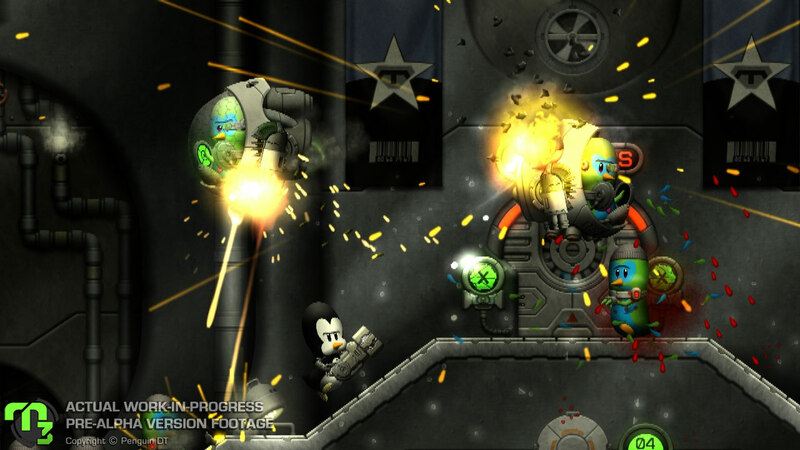 0:38 – Smartgun! This is basically that wonderful gun from The Fifth Element. I love the concept so much I've made it as mod for Quake, Quake II and Half-Life - and when we needed some wacky Pluto weaponry I almost slapped myself for not featuring it in TAGAP sooner! Just tag a target with the alt.fire and watch those bullets home in – or don't tag anything and use it as an assault rifle. 0:40 – Mutant penguins of TAGAP 2 became such fan favourites we decided to bring them back, only with cosmic upgrades appropriate for their Funky Penguin nature. All the gear he is strapped with actually has gameplay significance, but I'll keep something a secret for future reveals. Meanwhile, look in awe at his giant space-buzzsaw of death! 0:46 – Meet the shrooms! These robot mushrooms are actually conceptualized by Petja, who is designing all sorts of things this time around. Petja did the initial design, I re-draw it in the Pluto-robo style and then the beast was assembled and tested until we both were happy with it. These are fun little bastards to fight, as their caps are indestructible and big enough for them to hide in. 0:50 – Overdose slow-mo is still here, only a bit different. As you can carry some pills with you now, you can basically enter slow-mo at will – given you have at least two pills at your disposal. What you see here is the lightest form of OD, but deeper the effects, more distortions and colour tilt you'll experience, ultimately leading into hallucinations. 0:52 – The greatest trailer of all time describes that the trailer should end with a montage set to rock music, as intended to blow up any synapses you may have left in your brain. And it's hard to argue with that, as the familiar TAGAP anthem kicking in while even the enemies come at you with MIRV launchers! 0:54 – We originally planned to use more close-up shots like thesea, but capturing gameplay footage this way isn't easy. Imagine playing TAGAP with half the visibility, yet-to-be-balanced difficulty and no HUD or even the crosshair! At least we get to showcase a close-up view of Longlegs, perhaps my favourite robot enemy in TAGAPs so far. Also I never get tired of those Bezier batches for legs. 0:56 – Glimpse of our new Penguinator, an autonomous, rocket-spewing tank protected from front by nearly indestructible armour. And since the next question the long-term TAGAP fans will ask is 'if the regular one is so epic, is there a mecha-penguinator still?' - the answer is yes. It's just was sitting in pieces on the assembly line at the time of the recording. 1:01 – Always one-upping ourselves, the space pods that essentially replace the minichoppers of old are equipped with twin miniguns, making them much more dangerous than their earlier Earthly counterparts. And they have rocket jets for short nitro-boosts. I'd better apologize Pablo in advance for this. 1:03 – Cue in our new title screen and logo! Yes, I confess, I've been watching way too much Doctor Who, but I can't help it. And no, while the logo may look 3D modelled and rendered, it's not – I'm still rolling with 100% Photoshop when it comes to CGI artwork. 1:07 – I originally meant to roll with 'when it's done' mantra, but thanks to the baggage the saying carries these days, 'It's coming. Honest' felt more appropriate and accurate. The game is coming, I just have no idea when it'll be ready. Since the trailer is out, we took a couple of screengrabs from it, because why not. There is no particular reason for selecting these four, other than they showcase some of the new stuff we featured in the video and – more importantly – look cool. I especially like the battle scene with those spacepods; Debris, sparks, hot lead, shell casings... it's just a great action shot! My only problem with these shots is that apparently FRAPS HD video isn't as sharp as I thought it would be and these shots are clearly of lesser quality than the previous ones (snapped directly via TAGAP's own screenshot feature). I don't know is that a codec compression issue or if FRAPS just cheats a little in order to achieve recording, but these shots are clearly more pixelated. Another reason to dream of some proper video capture gear, I guess. Principal characters – Since we've focused squarely on the core gameplay and levels at this stage of development, we had no cinematics ready beyond the title screen. 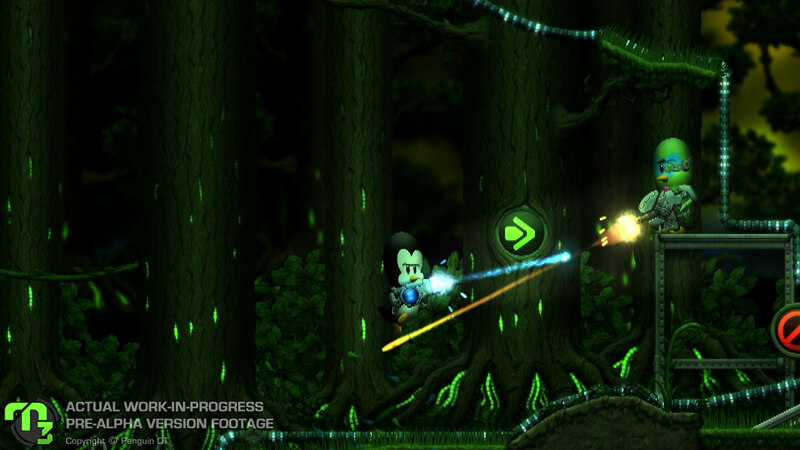 Nor do we have boss fights finished – well two bosses are ready but without levels to fight in. This means we had no way of introducing our lead characters besides Pablo. This pains me greatly, as we have quite a colourful core cast with multiple villains this time around, but on the plus side, at least we got to focus on the world these characters inhabit. But in the next trailer you will get to meet some of these key figures of Pluto – or I'll eat my fez. Special levels – In addition to the Metroidvania-alike replayable levels, TAGAP 3 will have several special maps serving as alternate routes and story set-pieces. Sadly, we had none of them ready for the début. While for sake of consistency it was perhaps better to feature just the purest gameplay, I would've loved to give a better sneak peek of the variety maps we will have. For example the prototypes we have for the low-gravity space walks in a penguin-fit space suit are spacetastic. Enemy variety – Each level will have their own special enemies, so the limited selection of levels meant limited variety of foes on display. As much as I love the Funky Penguins and their robot friends, I would've loved to show what I'm working on right now – cybernetic killer plants. Also featuring more of the Pluto-made vehicles would've been great. Then again, at least there's tons of stuff to show in the future! 1080p – TAGAP 3 engine was built ground-up for a very specific purpose; To be the end-all-be-all solution for us to do things in full HD. Thus you can imagine how much it saddened me to find out that due to hardware limitations we couldn't deliver our grand début that way. TAGAP was ready for it, FRAPS was ready for it, Petja's Crysis-capable gaming rig was more than ready – but the hard drive couldn't keep up with the massive files being dumped on it. Like I mentioned multiple times already, I'm considering getting proper video capture gear in the future, but right now we're stuck with these options. Sorry.